I stumbled upon Coke Studio relatively recently on YouTube, and I was immediately hooked. Coke Studio, as a branded concept (brilliant marketing by Coke), originated in Brazil, which, given its polyglot and polyrhythmic musical traditions, was undoubtedly a feast for the ears. But it’s Coke Studio Pakistan that caught my fancy (and that of many other transplanted desis). You see, I’m a ‘half-life Indian’: I have lived half my life in the US. My own musical-tastes were set in the Bombay in the ’80s, in St Xavier’s College, where I was weaned on a de rigueur diet of Pink Floyd, Santana, The Doors, and other such classic rock. Even then, though I sought out less well-known musicians, and was needled for listening to artists that none of my friends had heard of. Indian music was not an active part of my life, other than peer-group sanctioned events such as the college’s annual Indian Music Group’s classical music festival. When I moved to the US, I suddenly had access to an amazing selection of music. Albums I had to request foreign-returned friends and family to bring me were suddenly available right there. I soon came to appreciate not just the genius of Jazz giants like John Coltrane, Miles Davis and Bill Evans, but also the indie musicians toiling in small hole-in-the-wall clubs, creating music that was often more accomplished and interesting than that of the famous names. As my tastes evolved, I discovered the astonishing diversity of popular world music, encompassing Brazilian samba, Irish jigs and reels, South African township music, West African music, Afro-Cuban music, Latin American salsa and merengue, Algerian rai, and much, much more. The MTV series ‘Unplugged’ is worth noting at this point: Rock musicians re-interpreting their songs using only acoustic instruments. A crisp, clean sound emerged, where every instrument and every note is heard and the musicianship takes centre-stage. Remember Eric Clapton’s ‘Unplugged’ from 1992 with the stripped-down versions of ‘Layla’ and ‘Tears in Heaven’ that re-energised and revived his sagging career? In recent years, the great West African musicians Youssou N’Dour and Salif Keita have turned to this more organic sound, combining traditional instruments with modern studio-craft, creating albums that are their finest yet. In the US, we were treated to ‘Live from Abbey Road,’ where established and emerging musicians performed stripped-down versions of their songs at the famous Abbey Road Studios in London. To me, Coke Studio Pakistan is not just a musical phenomenon. It has helped me reconnect with the music I didn’t pay much attention to as a boy, connecting the old world with the new. Coke Studio to me has scratched an itch that I have long had. At its best, it draws upon the Indian classical tradition of improvisation by the musicians, as well as the Western classical tradition of structure and arrangement, where the producer uses his creative vision to harness the raw musical energy into a cohesive piece of music. It is a demonstration of masterful studio-craft by the producer, Rohail Hyatt, and the musical chops of a house-band nonpareil, together to create an underpinning for each song, which although produced to the hilt, still has moments of total spontaneity. Take the smiles that erupt on the faces of the musicians mid-way through ‘Alif Allah Chambay Di Bootey’, as they exchange glances and tap into some obvious infectious energy that has permeated the room. Or songs like the reflective ‘Hor vi Neevan Ho’, which draw from the common devotional music of the subcontinent, which predates and is independent of the religious belief-system being invoked. In India, that song could just as easily be a kirtan or a bhajan within a Hindu context. The sublime ‘Aik Alif’ sounds like one of the wandering mystic minstrels of the subcontinent — a Baul or a Sufi — just happened to wander into a studio, where he bumped into a rock band. Even if it doesn’t increase your faith in God, it will certainly increase your faith in music. ‘Kangana’ combines qawwali with the Hindustani classical Raag Malkauns, and is set to a back-beat inspired by Pink Floyd’s ‘Money’ (as the producer says in the clips): A daunting combination by description alone, but performed live in the studio masterfully. 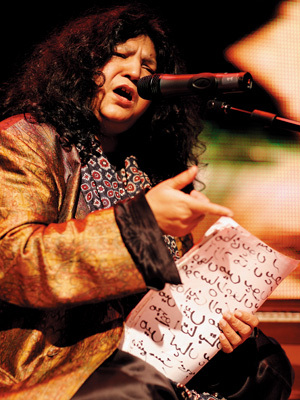 Listening to ‘Ramooz-e-Ishq’ by the amazing Abida Parveen, the western arrangement (especially the drums) seems like it was naturally meant to accompany and accentuate Sufi singing. (Of course, Nusrat Fateh Ali Khan had amply demonstrated this earlier in his collaborations with Michael Brook and Eddie Vedder, among others.) The luminous singing by Sanam Marvi on a couple of Sufi songs, and the sensuous ‘Chori-Chori’ by Meesha Safi, induce a slow-burn in the listener’s ears. Judging from its trans border popularity (thanks in no small measure to social media and the Internet), it has breathed new life into the rich musical tapestry of the subcontinent, by harvesting the unique music of the region, at once diverse yet instantly recognisable as part of a continuum. This has been Pakistan at its finest, reminding us of the shared cultural heritage that predates our religious differences. Reading the hundreds of comments on YouTube and Facebook, it is clear that it has struck a similar chord with many fellow expatriates. The only discordant note you hear is from the occasional jingoistic flame-throwing commenter, but, by and large, it is obvious the show has tapped into a desire for authenticity in music that has for too long been subsumed by the Bollywood sound-machine. So, starting June 17, we, on the Indian side of the subcontinental divide get to show the eastward musical extensions of this subculture, and I’m greatly looking forward to it. One hopes for a prominent place for Carnatic music (especially the violin), which has an unmistakable cadence, and is about as beautiful and elegant as music can get. Other performances I’d love to see: Advaita, the Raghu Dixit Project, and Kailash Kher. But I’m most looking forward to being jolted by unexpected synergies creating magical combinations, as has been the case in Pakistan. I fervently hope the Indian version doesn’t succumb to the trap of overproduction in some misguided attempt to one-up our brethren across the border. Always, always, put the music first. Sanjay,finally read this article -most enjoyable. 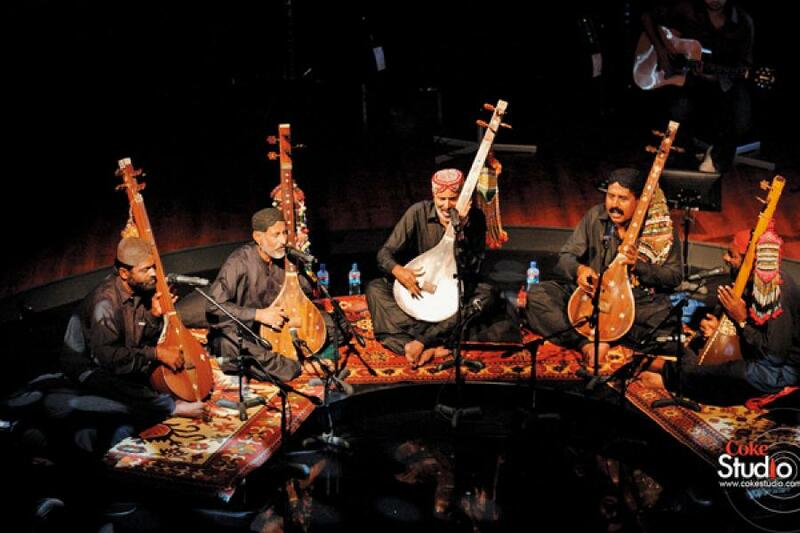 Sadly coke studio India doesn\'t measure up, though with large doses of carnatic music it might be comparable with the best of coke studio pakistan. @Straighttalk - Thanks for the comment, but the prior part of that sentence reads \"independent of\" \"....the religious system being invoked\" which was precisely my point, i.e., the musical form is drawn from cultural, not religious, commonality. Instead of writing \"the religious belief-system being invoked\" you can just write \"Islam\". The Indian readership is mature enough to handle it. Sadly reminiscent of some reviews of artists such as Nusrat Fateh Ali Khan or Ali Farka Toure in the western press where the writer ties themselves in knots to avoid referring to the specific spiritual component of the music. I had hoped CS India would prove its critics wrong. I am sad to report it hasn't fully :-( It has to still let go of its commercialism ego. A witty and discerning review. Music is our universal language, and we need such reminders that, as Monie elegantly writes: 'remind us of the shared cultural heritage that predates our religious differences.